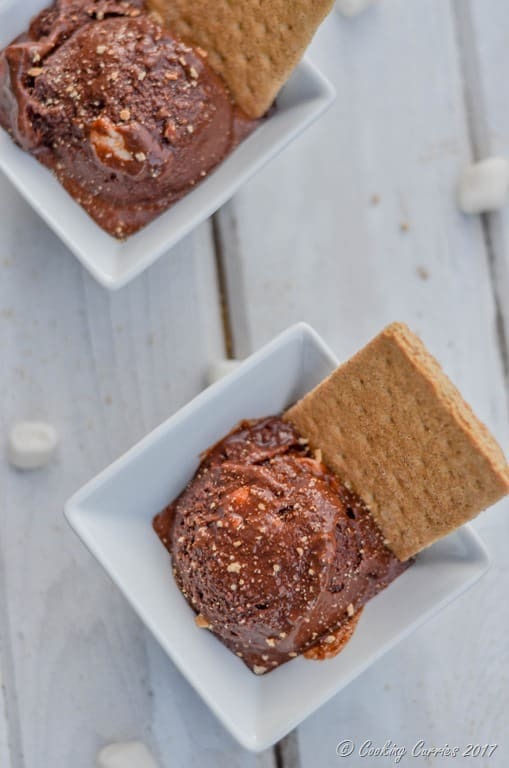 Get some camping and outdoor feels this summer, even when you are home, with this egg-less S’mores Ice Cream. 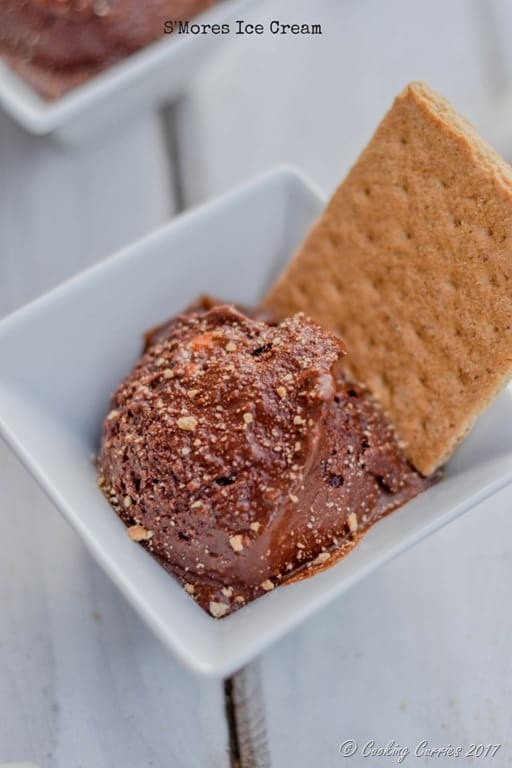 Roasted Marshmallows, Graham Cracker Crumbs and Chocolate Ice Cream come together for this fun summer dessert. The only ice cream or even any kind of dessert the kiddo will have is anything with chocolate. Chocolate cake, chocolate brownies, just chocolate, s’mores, chocolate ice cream – all that brings a happy smile on that little face. But all that happiness is reserved only for chocolate though. The husband and I are completely different from the kiddo though. You say dessert, we are there. We don’t even want to know what kind it is. We are partial to some desserts, we have a few favorites but we will eat anything and everything that is dessert. We go camping every year, but this is the first year that V remembers going camping and is excited about it. He was prepping for making s’mores by the campfire all through summer. So, I thought, why not make a s’mores ice cream to make the kiddo doubly excited. And you bet, he was! Our summer favorite Ice Cream is the ever popular Vegan Mango Ice Cream with Pistachios made with fresh mangoes and coconut milk. 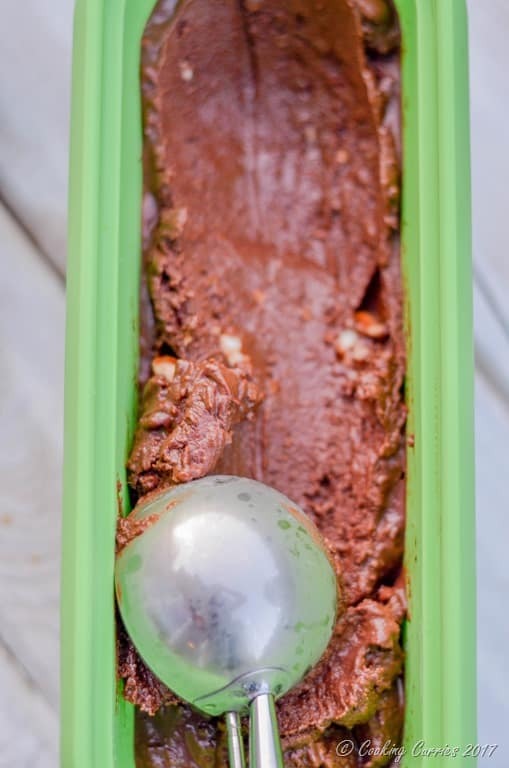 Get some camping and outdoor feels this summer, even when you are home, with this Egg less S’mores Ice Cream. Roasted Marshmallows, Graham Cracker Crumbs and Chocolate Ice Cream come together for this fun summer dessert. Bring the milk to a slow boil over medium heat. Whisk in the cocoa, sugar, espresso powder and salt. Cook for a couple of minutes. Remove from heat and let it cool down to room temperature. Meanwhile, toast the marshmallows in a toasted oven on broil. Watch the marshmallows at all time, as it can get burnt very easily. Crush the graham crackers in a food processor, to bread crumb like texture. 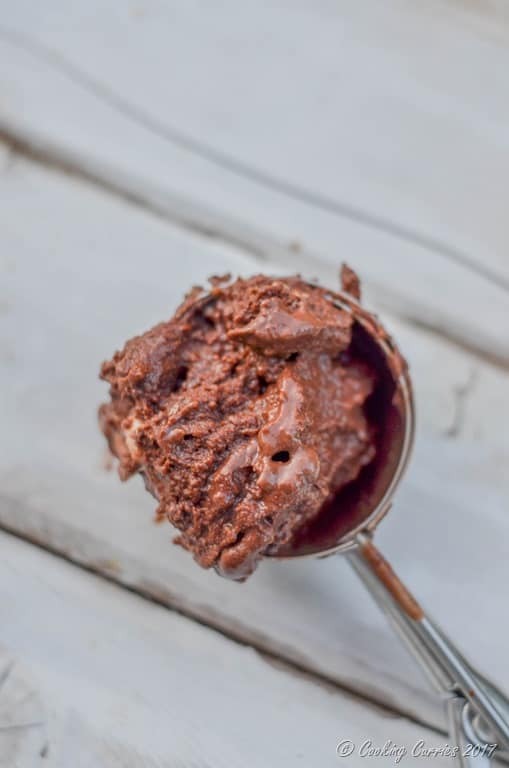 Add the cooled milk-cocoa mixture to your ice cream machine and churn. Once it is almost come together, add the toasted mini marshmallows and the crumbled graham crackers. Once done, transfer to a loaf pan or an ice cream container and freeze for at least 4 hours.